The stock market was placid on Monday, but there was a lot going on under the surface because of two big earnings reports from Bank of America and Netflix, and the crash in oil prices. The S&P 500 was down 0.1% and the Russell 2000 was down 0.51%. The Dow was brought 0.18% higher because of the financials. JP Morgan and Goldman Sachs pushed up the Dow as they were up 4% and 2.2% respectively. The Nasdaq is going to be down on Tuesday because of the weak Netflix earnings. I mentioned the market needed the financials to do well, but obviously the financials can’t be the only driving force. 8 out of 11 sectors were down. The financials were the best as they were up 1.8% and energy was the worst as it was down 1.18%. Energy was down sharply because oil prices crashed 4.2% to $68.06. The decline occurred because the Treasury Department stated some oil buyers can get waivers from America to buy Iranian oil despite American sanctions on the nation. As I will review in a future article, oil prices were a big benefit to June retail sales. A further decline in prices would hurt those gains. However, I don’t see a collapse coming because demand is still strong and there’s a deficit in the market. I think declines like this are a blessing because it lowers headline inflation and helps producers and consumers. An alternative way of looking at this situation is to say the consumer and producers have been hurt by the Iranian sanctions and now the price reflects supply and demand more accurately. I was wrong to suggest that Bank of America’s earnings would be poor like Citi and Wells Fargo. I was also wrong to suggest its stock would fall after earnings like the others. Bank of America’s earnings helped the stock move up 4.31% and push the whole sector higher. Q2 EPS was 63 cents which beat estimates by 6 cents and was up 43% from last year. Profits were up 33% to $6.8 billion which beat estimates for $5.92 billion. A big reason behind the decent quarter which beat estimates was cost cutting as the bank cut expenses by 5% to $13.3 billion which was $200 million better than expected. Revenues were up 3% to $22.6 billion (excluding a one time year ago business sale) which beat estimates by about $300 million. Income taxes helped profit growth as they fell 43% to $1.7 billion. On the bright side, they allowed the firm to invest $500 million in technology. The best part of the quarter was that the bank set aside $800 million for credit losses which was below the estimate for $973.5 million. Non-performing loans fell $500 million from last quarter. One weak part of the quarter was loans and leases were $35.8 billion which missed estimates for $942 billion. The trend in these big bank earnings has been weak growth in lending. Bank of America stock was up, but that’s not enough to convince me the stock and the sector are ready to make new highs. Firstly, Bank of America stock was oversold as it was down 3.3% year to date heading into Monday. Another possibility is the steepening yield curve helped the sector. The 10 year yield was up 3.11 basis points to 2.8582%. The 10 year was very overbought, so it’s possible this was a correction in that trend. It was getting close to the May 29th low of 2.78%. The 2 year yield increased to 2.5966% which is the highest close of this cycle. This level makes sense because the chance of at least 4 hikes this year is now at 60%. There’s even a 0.1% chance of 6 hikes. If the banks rallied because of the curve steepening, it will be a short lived move because I expect the curve to invert in the next few months. Before I get to Netflix’s earnings, I’d just like to point out two things. Firstly, July 16th is Prime Day for Amazon shoppers which means there will be great deals. The day lasts 36 hours and gives deals on thousands of items. The fact that Amazon.com crashed is a good sign; it shows there is interest in purchasing products. Secondly, Tesla CEO, Elon Musk had a Twitter meltdown which cost the stock 2.75%. If Elon Musk’s position at the company is changed, I could see the stock falling 20%. His social media following helps drive demand for Tesla products. 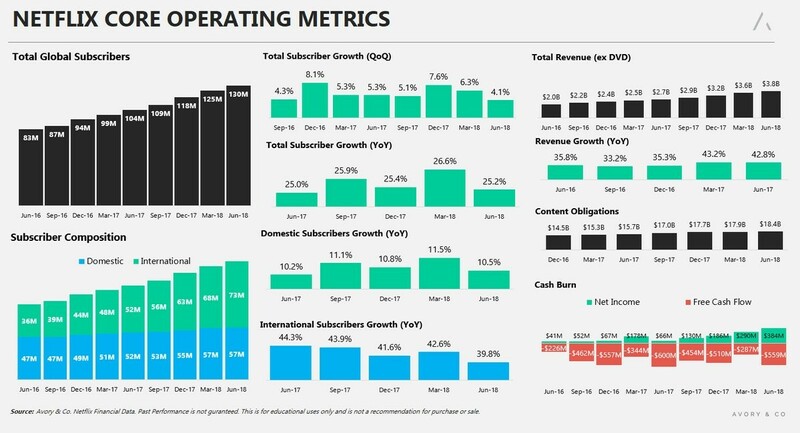 Netflix is the first FAANG name to report earnings. The stock fell 14.18% after hours because subscriber growth missed estimates by a lot. As you can see from the charts below, domestic subscriber growth was 10.5%. The additions were 674,000 which missed estimates for 1.23 million. International subscriber additions were 4.47 million which missed estimates for 5.11 million. Revenues were $3.91 billion which missed estimates for 3.94 billion. EPS was 85 cents which may have beaten estimates for 79 cents, but it’s not clear if the comparisons are relevant. On top of this weakness, the firm posted weak guidance for subscriber additions. The firm expects to add 5 million new subscribers in the next quarter which is below estimates for over 6 million. Netflix’s cash burn is high as the firm expects to spend $8 billion in 2018 on 700 original series. In Q2 the negative free cash flow was $559 million and the net income was $384 million. The company is taking a big risk by spending so much on content, but it has paid off as time watched has increased over the years and subscriber growth has been meteoric. Netflix stock is only a buy if the company can keep growing subscribers and raise prices. Unlike most firms, a minor slip up could cause the stock to fall massively given the leverage it has. I actually think the 14.18% decline in the stock after hours was modest given the weak guidance and the fact that the stock is up 148% in the past 12 months. I expect more weakness in the next few weeks. The goods news is investors are used to weak quarters occasionally. They get back to buying after the next good quarter.